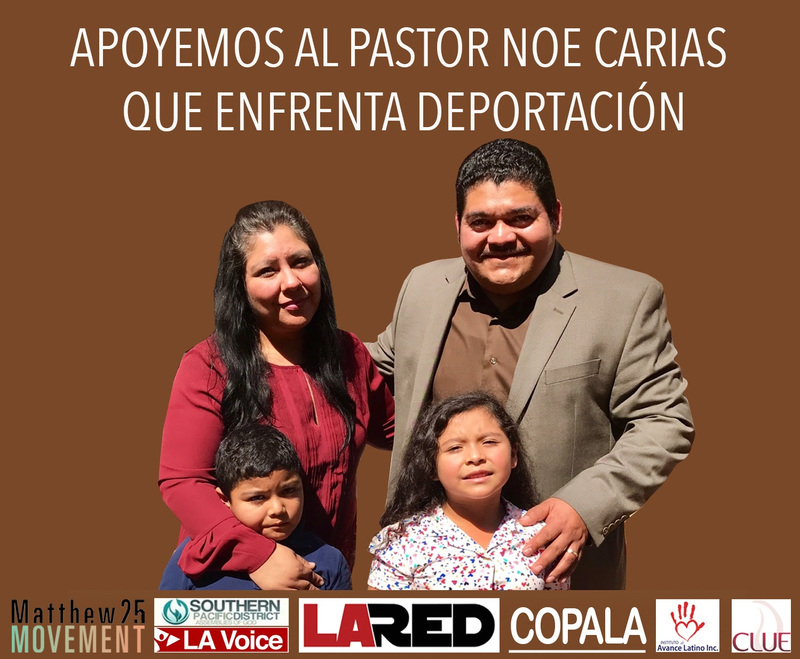 On July 24th, Pastor Noe Nolberto Carias Mayorga of the Iglesia Pentecostal Cristo la Roca de Poder Asambleas de Dios, an evangelical Assemblies of God pastor with a thriving congregation in South Los Angeles was detained by Customs Enforcement in Los Angeles when he went in for a check-in. This was solely a result of deportation orders received 25 years ago, when he was a teenager, because of entering without permission, and despite that he has motions pending in court. We will not stand by while his family is separated and his ministry harmed. This may be our Rosa Parks. 3- If you are somewhere else in the country, please join us in prayer, ideally in front of your local ICE offices. If you gather in prayer, please take a picture, post a picture with this hashtag #libertad4noe or #pray4noe and post it the Facebook page Matthew25/Mateo25 SoCal with the date and place noted. We will continue to update you on upcoming and ongoing prayer vigils until he is released and his family reunited. 4- Share on social media and encourage your networks to engage in the above action steps. Please keep the Carias family in your prayers. This entry was posted on Wednesday, July 26th, 2017 at 2:28 pm and is filed under Uncategorized. You can follow any responses to this entry through the RSS 2.0 feed. You can leave a response, or trackback from your own site.